Posted on August 15, 2011 at 1:44 pm. 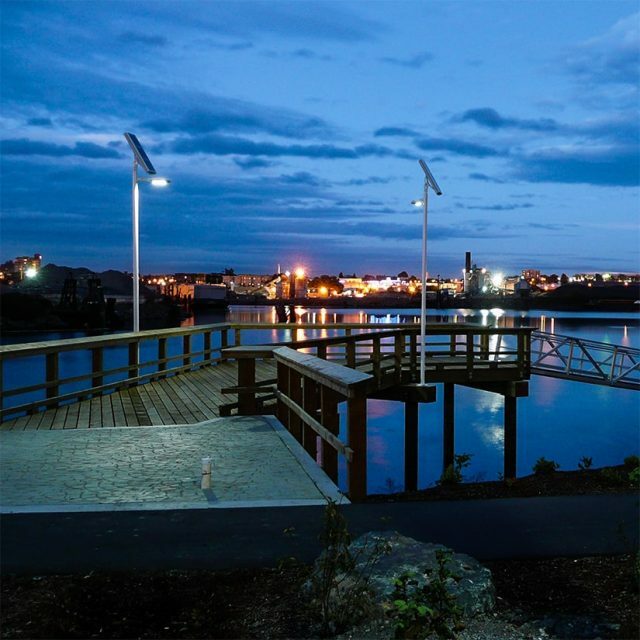 Carmanah solar area lighting is helping Dockside Green move forward in the development of an eco-friendly community that offers true environmental sustainability. Due for completion in 2009, the self-sufficient community will feature Carmanah solar area lighting along a portion of the Galloping Goose Trail; a popular rails-to-trails project that is considered one of Canada’s most heavily used commuter trails. The community is designed to encourage walking, running and cycling, so effective lighting and safety-enhancing technology along this trail is essential. Configured to operate year-round in the Pacific Northwest, the solar area lights will illuminate key pedestrian promenades and bicycle paths on the section of the trail that runs through the Dockside Green community. Powered by the clean, limitless energy of the sun, Carmanah solar area lighting provides a versatile and reliable illumination alternative that is eligible for LEED Renewable Energy Credits and can help Dockside Green in its commitment to developing a LEED Platinum community. In 2016, Safe Harbors of the Hudson decided to purchase the vacant lot next to their facilities, which had been empty for decades. The lot would be transformed into a fully accessible urban park, adding green space in the community while also creating a cultural and social hub that would enhance the existing programming Safe Harbors was already facilitating. Improving public safety was also part of the plan, and one aspect of this was adding effective lighting that would encourage positive park use.